Click here for audio of Episode 2074. Today, a Victorian lady takes a trip. The University of Houston's College of Engineering presents this series about the machines that make our civilization run, and the people whose ingenuity created them. Isabella Bird was born in an upper-class evangelical Anglican household in 1831, six years before Victoria became her queen. She grew up with all the prejudices we'd expect of her time and station. But then, we mustn't let our prejudices get ahead of us. She had what Victorians called "a sensitive and nervous temperament." She suffered headaches, insomnia, and a spinal problem; yet she became a world traveler and writer. At 23, she traveled to Boston, across northern America all the way to the frontier town of Davenport, Iowa, then back by way of Montreal and New York. Her book The Englishwoman in America is equal parts priggish and insightful -- prejudice wonderfully muted by objective observation. Example: the trip on Lake Erie from Detroit to Buffalo. Before she boards the steamer Mayflower, she watches militia parading with a silly-looking brass cannon. Then she reminds herself that militias like this beat the British at Lexington and Saratoga. She describes the Mayflower as an elegant 2200-ton ship driven by a thousand-horsepower, non-condensing, high-pressure engine. It has 81-inch pistons with a 12-foot stroke. She also ominously mentions that her Mayflower perished soon after, in a storm. She shares the women's cabin with another white woman, two slaves, and five freed black women. Huge waves batter the boat on the second day. Terrible fear and seasickness are all around her. She comforts the seasick infant daughter of a wretchedly ill freed slave. And, she observes, the black women are far calmer, even fatalistic, about the dangers and their suffering. She struggles (rather ludicrously) to fit all this into her own ideas about superiority. Still, we know education is taking place. This was just the beginning for Isabella Bird. She soon made a second trip to America. At 41, she toured Hawaii, New Zealand, and Australia. In Hawaii, she helped her chronic back problems by switching from riding sidesaddle to straddling a horse. She used that ability a year later in the Rocky Mountains, where she fell into an intense relationship with a trapper. Of course the chasm of social class was too large to cross. She did much of her writing in letters to her invalid sister Harriet. Harriet died when Isabella was 50, and the grieving Isabella married Dr. John Bishop, who'd cared for Harriet. He was ten years younger, but he died within six years. And she took to the road again -- Japan, Malaysia, India, Persia, Turkey, China ... 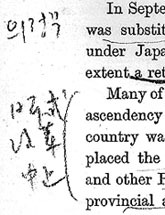 Throughout our very old copy of her book on Korea, an Oriental scholar has penciled notes in fluent Chinese and Korean script. By the time the tireless Isabella died at 73, she was a member of the Royal Geographical Society and planning yet another journey through China. And I tell you, her books are worth reading -- especially if you're as fascinated as I am by the complicated ways that everyone grows when cultures mix. I. L. Bird, The Englishwoman in America. Fwd. by Andrew Hill Clark (Madi-son: The University of Wisconsin Press, 1966): This is a reprint of Bird's 1856 edition. I. L. Bird, A Lady's Life in the Rocky Mountains. Intr. by Daniel J. Boorstin (Norman: University of Oklahoma Press, 1960/1984): Originally published in 1879. Mrs. Bishop (Isabella L. Bird), Korea & Her Neighbours: A Narrative of Travel, with an Account of the Recent Vicissitudes and present position of the Country. Vol. I and II, (London: John Murray, 1898/1905). D. Middleton, Bishop (née Bird), Isabella Lucy, (1831-1904), Dictionary of National Biography. I am grateful to Engines listener Anne Mulligan for suggesting the topic based on E. Kaye's book, Amazing Traveler, Isabella Bird. (New York: Blue Penguin Publications, October 1994). 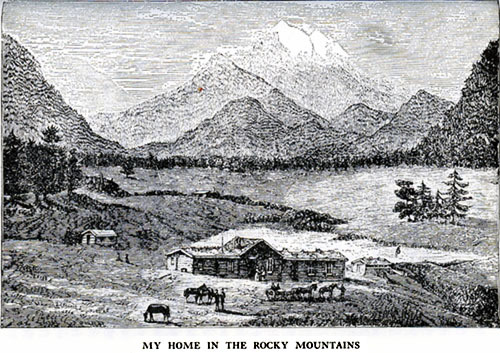 Illustration from A Lady's Life in the Rocky Mountains.